SURREY, B.C. — The B.C. 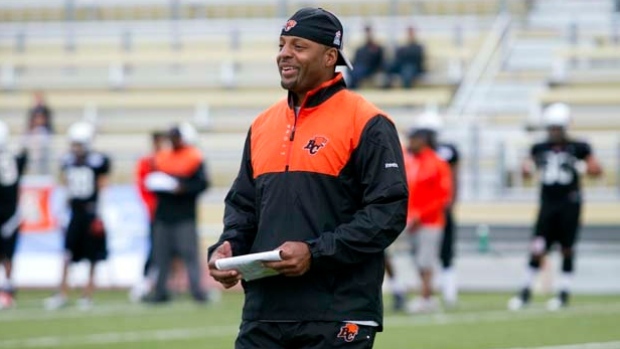 Lions are handing Jarious Jackson the keys to their troubled attack after the CFL club named the former quarterback as its new offensive co-ordinator on Thursday. Jackson played seven seasons with the Lions from 2005 to 2011 before serving as B.C. 's quarterbacks coach in 2013. The 40-year-old spent the last two seasons as the passing game co-ordinator and quarterbacks coach for the Saskatchewan Roughriders. He held the same roles with the Edmonton Eskimos in 2014 and 2015. "My thoughts on Jarious's ability as a coach are well-documented and he has gained some valuable experience over the past number of years," said Lions head coach Wally Buono. "He's enjoyed a significant amount of success since being here in 2013 and we're fortunate to have him returning to our organization." Jackson, who replaces Khari Jones after he was let go over the weekend, won the Grey Cup in 2015 under then-Eskimos and current Lions general manager Ed Hervey. He also won three Grey Cups as a player (2006, 2011 and 2012). Jackson will be tasked with tutoring B.C. quarterback Jonathon Jennings, who had a breakout year in 2016 but struggled through injury and inconsistency last season as the franchise missed the playoffs for the first time since 1996. The Lions averaged 26.1 points per game in 2017 — good for sixth overall — with Jones getting roundly criticized for a scheme that was often too predictable and failed to adequately use the weapons at his disposal. "I'm excited to return to where my career in the CFL began," said Jackson. "I believe the team that Ed and Wally are putting together is going to be very competitive and I'm excited to be part of the organization once again." B.C. also announced Thursday that Ryan Rigmaiden has resigned his position as director of U.S. scouting.